The introduction of manufactured paint tubes in the late nineteenth century enabled a group of restless painters to experiment with a medium that until that moment had imposed severe physical constraints; limitations that had previously kept them in their studios narrowing their creativity. By going out of the studio, these artists were able to approach their subjects and sources of inspiration. This technical innovation gave wings to a group known later on as the Impressionists. The boldness and the vision that we currently attribute to this group is based on their forging of a new pictorial language and the modification of the dominating perceptual models at the time, supported by other technical innovations such as photography. However, only a few of their fellow contemporaries understood the artistic paradigm shift that was coming, one that entailed a new way to represent reality either through the adaptation of existing modes of representation and/or the use of new tools. Reflecting on the entire history of modern and contemporary art, eyephoneography draws an important lesson from this anecdote and finds an inspiration for its goal therein: the impact of technology on the arts and the emergence of new languages and communication models as a result. 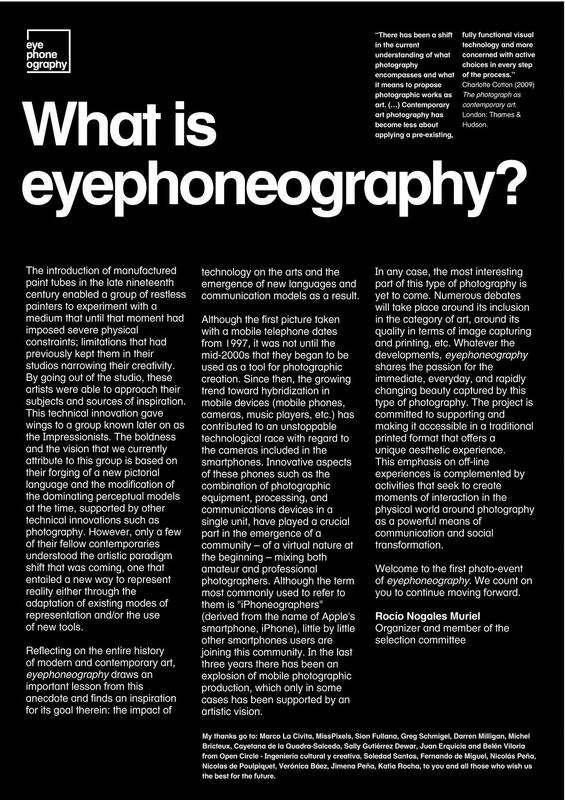 Founded at the beginning of 2010, eyephoneography is a project of exhibits and activities around mobile photography. Taking as a departing point the creation of a group of mobile photographers, we strive to create a space for collective and individual reflection and action around something that goes beyond a photography project. eyephoneography has a twofold dimension, the artistic and the social, and they have developed differently within the project. From the artistic viewpoint, we have always believed that, in order to grow and mature, mobile photography needs to break the boundaries of an increasingly wide but perversely self-referential community. It needs to reach out to and be in osmosis with as many as possible different fields like painting, visual arts, communications, advertising, art history and criticism. And we want to help to nurture this mutually enriching dialogue. Mobile photography represents an epitome of how we communicate and create in our contemporary societies. Plus it has a fresh attitude, an intriguing aesthetic, and many practitioners. It’s magic to see how amateurs are unleashing their creativity and how professionals are breaking free from some constrains (both physical and technical) that the camera imposes. Plenty has been said about the differences with traditional photography (and its ability to share the result via social networks, its playful aspect, etc.) but eyephoneography does not get caught in these discussions by focusing on quality, authors’ visions, and curatorial value. The consolidation of the artistic and the social aspects of eyephoneography go hand in hand. We approach the “social” from a double standpoint: on the one hand, mobilizing citizens as active, reflective and creative actors, and, on the other hand, launching initiatives aimed at social groups at risk of social exclusion and “social invisibility”. We believe in the potential of the arts and culture as sources of inspiration, personal and collective satisfaction but also as sources of employment and as schools of difference and democracy. The priority of eyephoneography is to fulfill its dual artistic and social mission. To do so, be behave like a social enterprise mobilizing various kinds of resources (from sales to donations, to volunteers’ time and assistance) in order to ensure the economic sustainability of the project and, ultimately, the artistic relevance and the social impact of the project. eyephoneography #1, September 2010, Madrid (Spain). The first exhibition of mobile photography done with smartphones organized in Spain featured Sion Fullana (Spain), Marco La Civita (Italy), Isabelle MissPixels Gagné (Canada), and Greg Schmigel (USA) with 12 photos each. The curatorial committee was composed of Michel Bricteux (photographer and diplomat, Belgium), Sally Gutiérrez Dewar (visual artist and lecturer in Contemporary Art at Madrid European University, Spain), Darren Milligan (digital media projects director at the Smithsonian Institution SCEMS, USA), Rocío Nogales (founder of eyephoneography), and Cayetana de la Quadra-Salcedo (architect, ch+qs arquitectos, Spain). During the opening, Brad Ireland (graphic designer, USA), performed as photo jockey curating in real time a digital exhibition of images uploaded to our Facebook page from all over the world. eyephoneography #2, April-May 2011, Madrid (Spain). The most recognized photography school in Spain, EFTI, opened the doors of its prestigious gallery to Carlein van der Beek (The Netherlands), Matt Burrows (USA), Stefano Giogli (Italy) and Jordi V. Pou (Spain) with 10 photos each. The curatorial committee was composed of Jose Luis Amores García (director of EFTI, Spain), Ana Bolívar (photographer and photography curator, Spain), Michel Bricteux (photographer and diplomat, Belgium), Isabelle MissPixels Gagné (mobile photographer and graphic designer, Canada), Attilio Lauria (director of the Photo Library of the Province of Cosenza, Italy), Darren Milligan (digital media projects director at the Smithsonian Institution SCEMS, USA), Rocío Nogales (founder of eyephoneography),Glòria Picazo (director of La Panera Art Center, Spain), and Marty Yawnick (mobile photographer, graphic designer and blogger at lifeinlofi.com, USA). 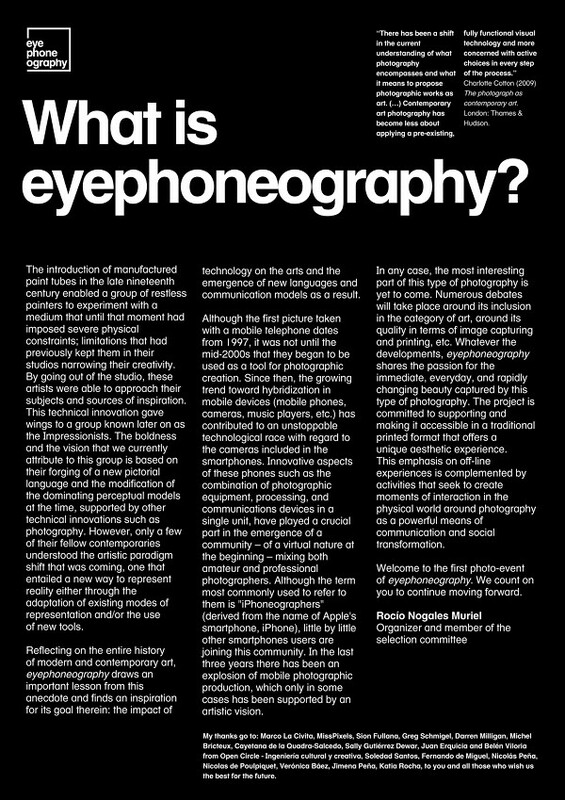 eyephoneography #2 was accompanied by a 94-page catalog of the exhibition with all the photographs exhibited in the show and four essays devoted to the emergence, history and future of mobile photography as well as the authors’ bios and statements. Before the opening, we held a debate in the EFTI auditorium structured around three axes pertaining to mobile photography: creation and circulation; institutionalization and conceptualization; and its social dimension. The debate included Attilio Lauria, Sergio Mantilla (marketing director of Photo España), Jose Antonio Muñiz (professor of Communication Theory at the Universidad San Jorge, Zaragoza), Rocío Nogales, and Jordi V. Pou. During the opening, Laura Baffari (graphic designer) and Paola Grilli (architect) founders of FotogriPhone (the first Italian blog about iPhone photography) performed from Italy as real-time curators of a digital exhibition of images uploaded from all over the world to our Facebook page. Mobile eyephoneography, September 2011 – August 2013, 11 cities, Spain. The world’s first traveling exhibit of mobile photography, composed of a selection of all the eyephoneography exhibits and touring the FNAC galleries of 11 Spanish cities for two years. During the opening, we organized a debate around mobile photography with the participation of Sergio de Luz (fashion photographer, Spain) and Rocío Nogales, and Sion Fullana, Jordi V. Pou, and Greg Schmigel via video conference. We also presented the YOUNG_EYE project and held the competition “Document Mobile eyephoneography” with a prize composed of the eyephoneography #2 catalog and a 50€ FNAC gift card won by Luis Rodriguez. Before the opening, we organized a photo walk around the Fnac Arenas with Carlein van der Beek, Isabelle MissPixels Gagné, and Jordi V. Pou. During the opening, we held a round table and debate around mobile photography including creative processes, the interaction between mobile photography and the social networks and the development of mobile photography with the participation of Isabelle MissPixels Gagné, Rocío Nogales, Jordi V. Pou, and Mery Viñas (Instagramers, Barcelona). The day after the opening, Lisa Pram (photographer, Denmark) held the workshop “Tell your story with a mobile phone”, with Isabelle MissPixels Gagné as invited artist. The competition “Document Mobile eyephoneography” with a prize composed of the eyephoneography #2 catalog and a 50€ FNAC gift card was won by Andrés De León. 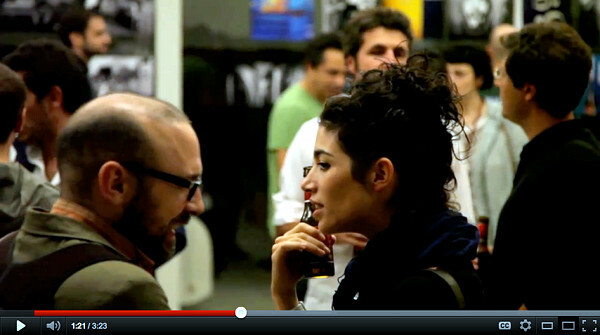 We organized the workshop “Mobile photography: storytelling on the go” with Mónica Lozano (Cienojos, Spain). The competition “Document Mobile eyephoneography” was won by Felicia Baños Pelegrin. eyephoneography #2 RELOADED, October 2011, Cosenza (Italy). Organized by the cultural association Arteaparte in collaboration with FIAF (Italian Federation of Photographic Associations) and the cultural association Fata Morgana, eyephoneography #2 RELOADED was in the official program of the VII Giornata del Contemporaneo (7th Day of Contemporary Art) an event organized by AMACI, the Italian Association of Contemporary Art Museums, which brings together 26 of the most important Italian contemporary art museums. The 7th edition held the patronage of the President of the Italian Republic and the support of the Ministry of Culture, confirming its position as one of the most important events of modern and contemporary art. The show included a projection of the images of eyephoneography #2 followed by a debate around new forms of contemporary photography with Attilio Lauria (organizer and curator of the i.Phoneography contest, president of the FIAF Calabria and editor of Fotoit), Emilio Arnone (polyhedric photo editor with numerous collaborations including Wim Wenders), Marcello Walter Bruno and Massimo Celani (professors of Institutions of Cinematographic and Television Languages, and Advertising Laguages at UNICAL). eyephoneography #3, April-May 2012, Madrid (Spain). Unlike the previous two editions, eyephoneography #3 had an open-call process that received 378 submissions in a month for a total of 1,890 photos from all over the world. The selection committee was composed of Terry Smith (Professor of Contemporary Art History and Theory, University of Pittsburgh), Montse Cuesta (Director, Architectural Digest AD España), Natasha Egan (Director, Museum of Contemporary Photography, Chicago), Ercole Egizi (Founder & Creative Director, Kennedy+Castro advertising agency), Attilio Lauria (Director, Photo Library of the Province of Cosenza, Italy), Giuseppe Veneziano (Painter and Visual Artist, Italy), and Rocio Nogales (Founder, eyephoneography). After a first selection round that resulted in 14 nominees, the selection committee narrowed down the list to the four mobile photographers showcased in the gallery of the Castellana FNAC flagship store in the heart of Madrid: Karen Divine, Annie Mallégol, Masha Ru, and Dave Weekes. During the opening, we organized a round table with Karen Divine, Annie Mallégol, Masha Ru, Nadine Benichou, and Rocío Nogales, the band Izal offered an amazing free concert, and Brabante, the first top of the range Spanish Premium beer, supported the opening with complementary bottles of their beer. A slideshow of 100 images from the 10 other nominees was projected throughout the opening. UrbanMegaEye, October 2012, Shawinigan (Canada). The organizers of the Mégapixels Photography Festival in Shawinigan (Canada) commissioned us what turned out to be the first thematic exhibition designed by eyephoneography completely from scratch for an external cultural organization interested in mobile photography. UrbanMegaEye was an exhibition around the theme of urbanism that included the work of four international mobile photographers: Nadine Bénichou, Richard “Koci” Hernandez, Graham Preston and Rafael Ricoy. While eyephoneography relies on the support of many people like the photographers we have exhibited, the professionals that have seated in our selection committees, the eyephoneography supporters, and entities like FNAC, EFTI, and TODO Aleman (Goethe Institut), at basis of the project stand Rocío Nogales (Founder) and Marco La Civita (Creative director). Rocío’s task is to provide the theoretical rationale for the project, attract new partnerships and alliances, and explore ways of securing it financially. Marco handles the tech side of the project, takes care of exhibitions production, makes sure our social networks are alive and that we never run out of cool ideas and initiatives. Hemos cumplido dos años y ya era hora de que tuviéramos una página “Quiénes somos” con nuestra historia, nuestra misión y nuestra gente.